A comment by reader chookie on the post of the Kingsnorth garden in miniature sparked a search for information on Japanese dish gardens, a variant of the bonsai for which there was a minor mania in early twentieth century America. Their popularity was likely due to the Japanese Pavilion at the 1893 Chicago World's Fair, which was the first exposure of many Americans to Japanese art and architecture, and created a sensation that influenced the likes of Frank Lloyd Wright. Instructions for Japanese dish gardens were printed in newpapers and magazines, and some can be found online. My favorite is the advice from a 1914 article in the NYT, reproduced above. 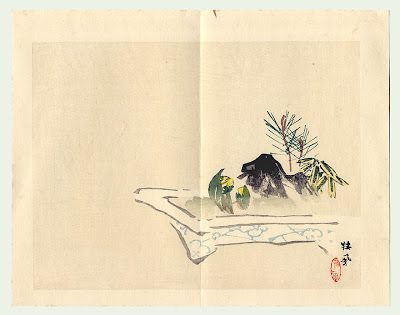 The origins of the dish garden are obscure, at least in English-language documentation, but I think the c. 1848 scenes I posted some time ago as bonsai would more accurately be dish gardens, since they include a complete tableau rather than simply a specimen tree. A 1921 House Beautiful article by Marion Brownfield notes that "celebrated Japanese artists have designed prints especially to be copied for these toy gardens, and that the making of them is an artistic hobby, equally popular with the gentle upper-class ladies of Tokyo, great statesmen, poets, and writers"
And she elaborates on the use of snow scenes: "White powder is sometimes used for a snow scene, as snow-capped Fujiyama, the sacred mountain of Japan, is a favorite scene to carry out in a Japanese landscape garden – large or small. " 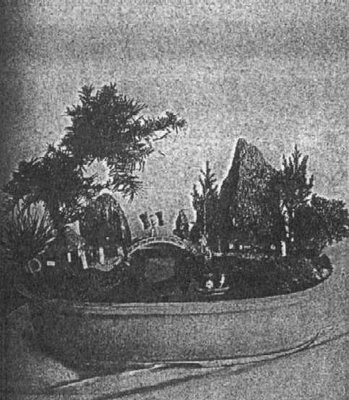 Also available online is a 1920 article from American Forestry, which asserts that the origin of the dish garden was as a model for landscape architects: "For several centuries the leading landscape gardeners of Japan have made miniature models of their work so their customers might see how the proposed gardens would look; very much in the same way an American architect will make a prospective drawing of a house, except in this case the garden is made perfect in every detail, except that it is in miniature. " "For a number of years an annual contest or exhibit of these toy gardens has been held in the city of Kioto, at which the leading landscape gardeners of Japan exhibit their work. A great demand has grown up among the tourists who visit the land of the cherry blossom for copies of these miniature gardens to take back with them to America. In response to this growing trade demand, one of the large Japanese nurseries has opened a branch near New York City, where one of their expert garden designers devotes his entire time in constructing miniature gardens for the American public." Thus the New York Times article; for those who couldn't afford the purchase! The grainy pictures included with the American Forestry article (below) may be examples from such a Japanese nursery of miniatures. That is just so interesting. Thanks for all that work. My goodness! This is amazing! Thank you for being interested enough to investigate. I'm off to tell a few friends about this! Thank you for sharing this...lovely! We are planning a dish garden workshop event here at Bowood Farms in St. Louis, MO, and I loved this posting, since I am preparing the Garden Tip Sheet for the event. I wanted to let you know that, as I continued my research I discovered that the 1921House Beautiful article was lifted almost entirely from a 1908 book written by Florence DuCane called The Flowers and Gardens of Japan. You can find excerpts @ http://www.phoenixbonsai.com/1900Refs/DuCane.html . Also you can go to http://www.phoenixbonsai.com/ and then go to "Site Map" and find LOTS of bonsai history - it looked like something you'd be interested in - I'm enjoying dipping into your blog!